Every time you drink a Coke, enjoy an ice cream or sweet chocolate treat, go to the cinema, or listen to the latest popular music hit, you can thank Australia’s Greek cafés. Leonard Janiszewski and Effy Alexakis, who have been researching the history of Australia’s Greek cafés for over a quarter of a century, point out why. Greek cafés in Australia provided British-Australians with their familiar meal of steak and eggs, chops and eggs, mixed grill, fish and chips, and meat pies, but more importantly, they cemented the growing popularisation of American food-catering ideas instigated through Australia’s earlier Greek-run food catering enterprises – the oyster saloon or ‘parlor’ (American spelling was usually used) of the late nineteenth and early twentieth centuries, the ‘American-style’ soda bar/sundae ‘parlor’ which had appeared by the mid-1910s, and the ‘American-style’ milk bar which had emerged by the early 1930s. The introduction of American food-catering ideas to Australia through the nation’s early Greek food caterers should not be surprising, given that quite a number of these Greeks had relatives and friends living and working in the United States, or had been there briefly themselves working for Greek-American food caterers; the United States remained as a major drawer of Greek immigrants until the early 1920s. Capitol Picture Theatre, Wagga Wagga, NSW. c. mid 1930s. The Golden Star Milk Bar, Hay Street, Perth, WA. c. mid 1930s. The Greek café was essentially an evolutionary amalgam of its three predecessors. In names such as the Niagara, Monterey, Californian, Astoria, New York and Golden Gate, the American component of the Greek café’s creation is well suggested, but more so in its provision of customers with American sundaes, milkshakes, sodas and freezes or crushes (iced drinks), American confectionery (hard sugar candies and milk chocolate bars), and another popular product, American ice cream. Although the Greek café did not introduce traditional Greek dishes, as catering to the established tastes of their overwhelmingly British-Australian clientele was paramount, steak and eggs could be purchased with an ‘American Beauty’ fancy sundae for dessert, and a ‘Spider’ soda drink or flavoured milkshake to wash it all down. The union proved commercially successful, and to a degree, the Greek café became a ‘Trojan Horse’ for the Americanisation of Australian eating habits well before the second-half of the twentieth century. Greek-run oyster ‘parlors’/saloons, soda bars/sundae ‘parlors’ and milk bars had pointed the way towards the successful merger between British-Australian preferred tastes, and American food-catering ideas, technology and products. Greek-run oyster saloons or ‘parlors’ were pioneered by the Comino (Kominos) family (originally from the island of Kythera) in Sydney. Initially these were fish-and-chip outlets, and although they maintained a focus on oysters (bottled and fresh), they soon acquired a wide diversity of foods (cooked meat and sea food, fruit and vegetables, chocolates and ice cream). Sit-down meals and a take-away trade were both catered for. These enterprises had men’s and women’s lounges and welcomed families. In contrast, British-Australian run oyster saloons traditionally limited their food selection (almost exclusively oysters), as well as their range of customers. Whilst the diversification of foods provided, together with the idea of attracting a broader range of clientele are suspected as possible American influences reflected by Greek-run oyster saloons, the introduction of the American ‘front service’ soda fountain as well as American candy, ice cream and ice drinks through these enterprises, is beyond doubt. Although the leading protagonists of the Comino family seem not to have had food-catering experience in the United States, some members of the extended clan who arrived in Australia most certainly did, as well as a selection of other Greek proprietors of oyster ‘parlors’. In 1912, three Greek migrant/settlers from the United States, Peter and Constantine Soulos and Anthony Louison (Iliopoulos), formed the Anglo-American Company in Sydney. Based upon the American drugstore soda bar, the company’s shops (five by the mid-1910s) exposed Sydneysiders to the ‘front service’ soda fountain – these fountains were installed into customer service counters and created effervescent water through impregnation with a gas under pressure, to which flavours/essences were added, and if desired, ice cream. George Sklavos’ American Bar café in Brisbane also featured such a soda fountain in 1912. Sklavos had spent some time in America. Angelos Burgess (Tarifas), yet another Greek who had been to the United States, installed a ‘front service’ soda fountain in his Niagara Café in Newcastle, New South Wales, just before 1910. Arguably, James Sigalas’ Anglo-American cafés in both Melbourne and Adelaide also featured such soda fountains before the 1910s. The public appeal of these fountains was such that many Greek oyster ‘parlor’ proprietors quickly incorporated the new food-catering technology (compressors and pumps were initially imported from the United States) and commenced producing a wide range of ‘exotically’ flavoured soda drinks – from pineapple, and strawberry, through to sarsaparilla and hop ale. American ice cream sundaes also appeared around this time, with the titles of some clearly declaring their American origin: ‘American Beauty’, ‘Monterey Special’, and ‘Yankee Doodle Dandy’. Moreover, Greek-run oyster ‘parlors’ now began to evolve into soda bars/sundae ‘parlors’, whilst retaining the sit-down meals and diversity of foods of the oyster saloons. In 1932, Mick Adams (Joachim Tavlarides), opened Australia’s first modern ‘American-style’ milk bar, the ‘Black and White 4 pence. Milk Bar’ in Sydney. The ‘milk bar’ was created by Adams based upon his observations of American drugstore soda bars – he had visited the United States two years earlier. In Australia, the Greek-run oyster saloon and soda bar/sundae ‘parlor’ had placed prime importance on sit-down trade for meals, drinks and desserts. 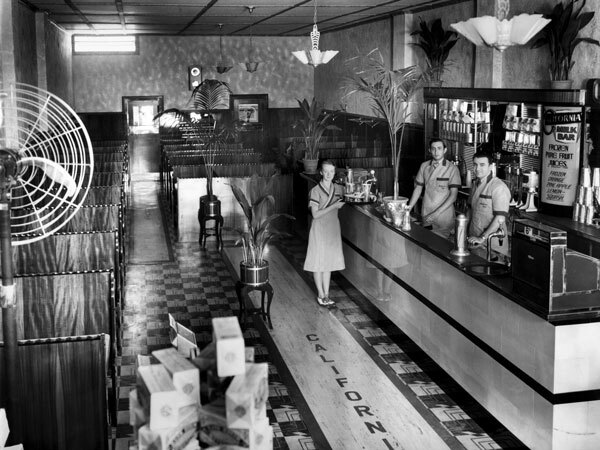 American drugstore soda bars emphasised quick stand-up and bar-stool bar trade (soda drinks, milkshakes and sundaes) over sit-down meal trade. Adams firmly took up the American soda bar catering emphasis and highlighted the milkshake. Seating capacity in Adams’ premises was restricted to just six small two-seater cubicles along one wall, the main feature being a long hotel-style bar with soda fountain pumps and numerous Hamilton Beach electric milkshake makers (imported from the United States). No cooked meals were offered. On the first day of opening 5,000 customers frequented the milk bar, and as many as 27,000 per week then began to patronise the establishment. Other food caterers were quick to adopt the idea and within five years of the opening of Adams’ original Black and White Milk Bar there were allegedly 4,000 milk bars in Australia; most were Greek-run. Food caterers in Great Britain and New Zealand were also quick to embrace the concept. While soda fountains were retained in the milk bars, by the mid to the late-1930s, the diversity of sit-down meals, take-away items and broad customer range of the earlier Greek-run oyster saloons, had combined with the popularity of soda drinks, sundaes and milkshakes, into the classic Greek café. In the Greek café, the melding of British-Australian tastes and American food-catering ideas was firmly cemented, and found its clearest and most popular long-term expression. Of course, new American food-catering ideas continued to impact on the Australian Greek café throughout its ‘golden age’ of existence (1930s to 1960s), most notably the hamburger – a meat patty popularised in the United States and introduced to Australia around the 1940s. In their heyday, country Greek cafés were an eating and social focal point for rural communities. As Joan Margritis (nee Farquharson), who frequented Greek cafés in south-eastern Queensland during the 1950s and 1960s, points out: ‘the Greek café was where people use to meet and eat. “I’ll meet you at the Greeks” was the saying in most country towns’. Star Milk Bar, Darwin, NT. 1948.